Q: Ben, if we could start with you, great to have you with us. Very rainy and wet this morning. We know you were running your new floor because Romain Grosjean told us yesterday. Were you able to get to grips with it? Ben AGATHANGELOU: I think things were clear already by the end of Spa to be honest, so here in the wet we're not going to gain that much more this morning, so we're taking it as a given that things are behaving as we saw by the end of Spa on one car. Q: Tell us too about the relationship you have with Ferrari. Big upgrades to the power unit this year and you really seem to have benefited in many ways from Ferrari? Agathangelou: Obviously it's an enormous strength to have Ferrari as a partner and we benefit clearly from the engine. The engine has made a huge step this year and I think we have been able to use it, maybe not so much so in the past. We've done a fair amount of our own development, the company is growing, so we've managed to extract from all parts of the budget. Mattia BINOTTO: Difficult to answer. I'm always more keen to look at the whole package and not try to split it into different factors. I think the difference to Mercedes overall was very small at the end. They have been on pole in quali, so they have been the fastest car, as a matter of fact, and I think that in the race our pace was very similar. So to try to distinguish if there is a little difference, where it's coming from, is a very difficult exercise. Our package is working well as a whole, from the aero, from the chassis, mechanicals and the power unit and I think that as well in terms of development we are all focused on all the areas. Binotto: Certainly we are in a better position compared to ourselves, to start with, and if I consider Spa last year, for example, we were not as competitive as we have been this year. I think that since the very start of this season, since the launch of the car, we mentioned and we said that we focused our development in terms of efficiency and to make sure that our car could compete on medium-fast circuit types and I think that somehow we have achieved it. On circuits where efficiency is important, like Silverstone, like Spa, we got good results and I think that is a good base for the rest of the season. So again, compared to last year, I think we can count on a car, which is certainly better in efficiency today. There are still eight races to go, so it's still long and it will be a long and difficult battle. Q: Thank you Mattia and good luck this weekend. Aldo, we've heard about the Ferrari challenge, how do you and Mercedes assess what Ferrari have done this year? Do you feel they are much closer to you than in the past? Aldo COSTA: As Mattia was saying, the two cars are very, very close. Yeah, we would say closer than in the past. You mentioned about the last part of the season last year, where we stretched our legs; obviously we hope to stretch our legs again. But we have to see if Ferrari will allow us to do that. It's a very close fight. Development on development, each race, and we will carry on introducing new performance elements and we will carry on developing the performance of the car as much as we can up to the last race really. Costa: It was, as you can imagine, something that was discussed a long time ago. After having enjoyed an unbelievable amount the experience in Mercedes in the current role - seven years in the UK, really, really fantastic - I did ask the team to start being not in the same position, having a bit more time for myself, for the family, back to Italy and we found together, discussing together, again an opportunity for other people to grow up, to develop the team, so this is what I'm doing, as well as the current role - developing the organisation, developing people, team, mentoring, and by the end of the year my main new function will be, as you said, technical advisor of the team. I will work for James, I will work for my current direct report that will grow up in terms of responsibility and I will carry on mentoring and I will carry on collaborating with the team, developing capability, developing process, but a bit less involved from the timing point of view. In my opinion after 31 years of Formula 1 it is the best compromise for me to carry on being very fully engaged but as well, on the personal, finding better equilibrium. Q: And more time, as well, to indulge in your passion for driving Formula 1 cars? Costa: Yeah, yeah! That's a growing passion. I'm part of the Mercedes senior driver programme! It's important to have a group of driver for the third age of the future, because of the world population, the average age is growing. Joking apart, I'm enjoying a lot driving cars. Mercedes gave me a big opportunity and a friend of mine, who you know very well, Paolo Barilla, gave me another opportunity to test a lot of cars, so yeah, it's a very nice moment, a nice experience. Q: You are never too old, Aldo, so good luck with all of that. Simone, so, technical director of Sauber since the beginning of July. How's it going? How's life in Hinwil? Simone RESTA: Well, how's it going? I think it's going pretty well. I'm happy with this new journey that just started at the beginning of July. I apologise if I show a lot of emotion, but new job, technical director here in Monza, in our country, is just a lot! With a lot of friends, with Aldo, who was my first boss at Ferrari, with Mattia, who has been a great colleague and a boss recently and also with Ben. It's a lot, but I feel very happy with that and I think my experience in the Sauber-Alfa Romeo team that started at the beginning of July, I find it very interesting, a new challenge in a different role, there is a lot to learn but it is a good step for me, for my career. Resta: If I was able to read the future probably I would do something different. Joking apart, the trend so far has been good. I think it's fair to say that we are slowing down our development rate for the time being, and we are concentrating mostly on next year's car, which is a big challenge but also a big opportunity for us to close even further the gap to the big ones. I hope we will be progressing a little bit in the next races and that we will be closer and closer to Q3 with both cars. Q: (Scott Mitchell - Autosport) Mattia, earlier this year we had the FIA's side of things when they were going through the Ferrari engine checks, just to make sure everything was OK. They had all their understanding of the energy recovery system, that sort of thing. Could you just give us your explanation of how complicated it was to satisfy everything the FIA wanted - and are you happy that you have now ticked every box you need to and you're OK for the rest of the season? Binotto: Obviously, the power unit is a complex element and it has been since 2014. FIA is fully aware of our components and it is our duty as well each time FIA is not fully, let me say, convinced that there is something right or wrong for them to inspect, to understand better. I think it's simply what happens at the time there is some questions: we answer; we explain and I think that's what happens. That's it. FIA certainly is happy, declaring our car legal at every single race, and on our side, honestly, fully happy at seeing the point is completely closed by them. Q: (Edd Straw - Autosport) Another question for Mattia. When you took over your current role, Ferrari was having a difficult season in 2016 - but we've seen huge progress since then. Can you just explain, in brief, how Ferrari has managed to turn around from that difficult position into its current position. This upward trajectory. And just explain a bit of your philosophy of how you issue technical leadership to the team to get that result. Binotto: Initially, I think it's fair to say that our team, in terms of individuals, is very strong. We've got very high skills; it's a fantastic team in that respect, whatever are the areas. And from the power unit to the chassis and to the aero. I think what we're benefitting the last seasons is certainly stability in terms of the organisation, which in F1 is very important, because through the stability somehow you may start to set down a way of working, improve your procedures, your internal process. I think, relative to myself, I'm certainly not an expert in all the areas. 25 years of experience in F1; great time with Ferrari at the race track in the time of Michael Schumacher but always as a power unit man. When I grew up in that final role I think what for me what was important for me was to set the objectives but to make sure that the people were comfortable in their role, understood the internal process and work better not only as individuals but as a team. And where we've focussed all the effort is, I think, to make sure that the team was working properly as a team, and forgetting about the individuals. And that's why, again, I think we are thinking about the car as a fully package, and not try to split down in terms of different components or units because we are a team and what is running is not a power unit or a wing but a full car. So, again, all the effort was to build the team as a team and set the right objectives, deal with them, try to be ambitious. I think that's somehow what happened in the last two years. Q: (Dieter Rencken) Gentleman, this morning Michelin confirmed that they will not be tendering for the tyre supplier contract, and they gave as one of the reasons the fact that targeted deterioration goes against their objectives for a sustainable and well-engineers tyre. As engineers, how do you feel about that comment. All of you. Agathangelou: OK. I think we can see that the nature of the tyre that we currently run, everyone can see the nature in which racing is governed by the characteristics that we inherit. Obviously, it's been a massive evolution in the sport over the last four or five years with respect to understanding and managing how we make use, and strategic use of the tyre behaviours that we find. I think ultimately I can't speak for Michelin's motivations: they're a great company, I've certainly worked with them in the past and they were more than capable of delivering what their set objectives were - more than that I can't speak on their behalf. Certainly, we're just in the business of making best use of what we're given. Binotto: Very difficult to judge and to comment. I know that the FIA is dealing with the tender; they are doing it by themselves and have started the process and are setting the targets. We have not been involved in the matter. So, without being involved, difficult to really to give a judgement, but I think as Ben meant. So, it was just mentioned that if Michelin does, somehow, make their choice, certainly they have gone, for them, what is the best choice. Costa: My thought is that we are in front of this usual discussion between what is the best for the show and what is the best for the performance. Of course, for the performance, specifically of tyres, and the current situation is not the best, but for the show, according to the work that has been done, the discussions that we have done for many many years, this was the trend that the strategy group and the F1 community wanted to go. So then I think we need to define the objectives, the objectives need to be defined by the government or at the end by the people that are part of the strategy group and if for the good of the show, the good of the sport, we have to take a certain direction, the single tyre manufacturer has to follow. There are no other chances, really. Resta: We just learn it now. All I can say is that we've got a lot of respect for Michelin history, for their story, for their technology and also for their decision. And if their strategy is not (inaudible) with the F1 business model, with the direction we're trying to develop, I feel sorry for that but it's one of the times that two roads cannot meet each other at some point. Q: (Sam Collins - RaceCar Engineering) There's been talk in the media about the 2019 technical regulations having an even higher rear wing than was originally proposed in the draft regulations which have been amongst all of you so far. Is it a bit late to make changes like that and how would it affect the balance of your car? Resta: I think it doesn't look to be a dramatic change. Of course, having the rules defined as early as possible helps all of us to just lay down the (inaudible) of the car and work developing it but ultimately I think everyone has got a big engineering group behind us and we can adapt to it and follow it. And especially in a case like that where it's done for the purpose of safety, so to improve the safety of the driver. Costa: Yeah, the changes that we are seeing for 2019, I think they were quite last minute changes but we are capable to develop a car in such a time frame so it's not a big problem per se but the issue may come from the fact that if they will be effectively helping what is the aim, which means improving overtaking and improving the capability of the car to follow, we will have to see if the direction that we wanted to take is exactly what we will reach. Binotto: Relative to your question, is it too late or not for such a change, first we need to be honest: you cannot change the regulations if there is not unanimity from all the teams. Indeed the team have accepted it means that somehow we are able to manage and to (inaudible) the change so it's not something that is imposed, it's something that we are discussing through the technical working groups and we are all agreeing through our vote, so it has been accepted so whatever change, accepted or not, means we are accepting, we are able to (inaudible). Agathangelou: I think that particular example is just one of many in the way that exchanges happen between the teams and the FIA and actually, with respect to the rear wing in particular, although it was quite late, there was a fair amount of discussion that preceded it that indeed investigated alternative ways of increasing visibility, like reducing the rear wing box height. There was a general consensus that because development had been under way, we were dealing with a wing that fit a particular box and the fact that it shoots up by 50mm isn't a game-changer, so the maturity, if you like, that precedes a decision is fair and we're all familiar with that, we're all party to that. 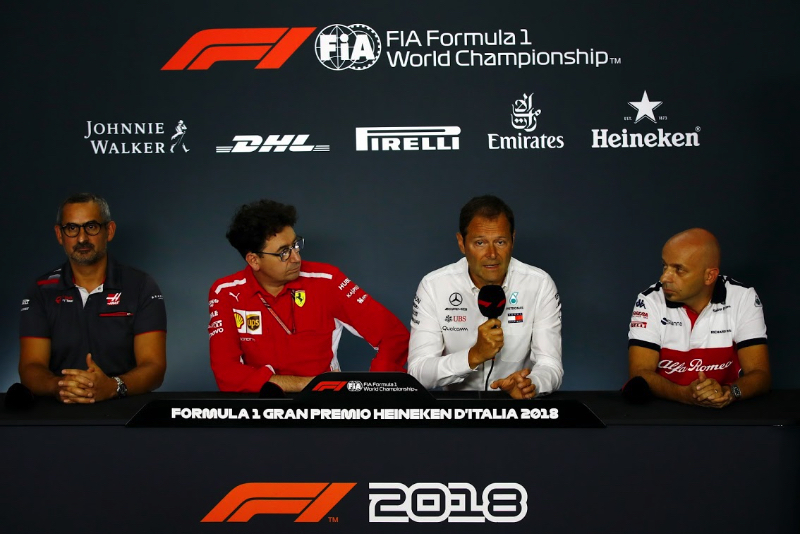 Q: (Dominik Sharaf) Mattia and Aldo: Liberty Media said that the 2021 engine regulations could be delayed because there is not enough interest by new manufacturers but we know that Porsche, for example, is waiting for a final decision and a final version of the regulations, to decide on their Formula One project. So who do you think should commit first: is it Formula One or new engine manufacturers? Binotto: Obviously having new manufacturers is always a good thing so if we are many and more manufacturers there's more fighting in the championship which is something which is good. By 2020 the Concorde Agreement is finished and by 2021 we have the opportunity to have a new set of regulations on which we are working, together with the FIA and F1 Management. I think that obviously it's not a matter of delaying or not, it's a matter of setting something for 2021 which is necessary. Discussions are on-going, we've got regular meetings and I think that at the moment we are somehow close to define what we believe is the best compromise or the best solution for 2021. Costa: So my thought: what we have got at the moment I think is a great power unit, it's a very very efficient system, very modern in terms of layout, quite innovative. So really making something better, ruling something better is not that easy. There has been quite a lot of conversation about it and going in a direction and then coming back. It will take time to define something better for the sport and unfortunately if new manufacturers want to come, they are very very welcome but there is nothing else than competing with the current rules if the rules will stay the same or still waiting for more time for the new formula. There's no other possibility. Q: (Christian Menath) Aldo, it looked like Mercedes started with the stronger car at the beginning of the season but I think it's fair to say that the last races, even for the results didn't always show it, Ferrari had the better car. In which areas do you think Mercedes was out-developed by Ferrari? Costa: Yeah, between race to race, there is always a variability of performance that is related to many many aspects: type of circuit, tyre management, key performance element of the car itself. So there is for sure… when two cars are very very close in terms of overall package, you will see anyway a variability. So we think we are very very close. We do not think we were particularly faster and we do not think we are particularly slower. As I said, it's just a matter of variability of races. We see that Ferrari has done big progress in the power unit and we see that we have got two cars that are quite similar, both very competitive and as I said before, it will be a matter of introducing more development, solving more issues and being at the end the best car, not making mistakes, having good reliability will be key because not many results can we lose without impacting the final result, really. Q: (Dieter Rencken) Aldo, talking about your decision about becoming an advisor to the team, I know that you're wearing a white shirt but when you wore a red shirt, Rory Byrne did something very very similar where he moved out, became an advisor. Is that your blueprint for this, where you will effectively take on a Rory Byrne-type role for Mercedes? Costa: In terms of formal arrangement, maybe yes, yeah, such a type of arrangement but myself and Rory have two different experiences, we've got different areas of influence so we are different but more or less something like that.